Come and join us at Trimmies Craft Challenge, our sponsor this week is Lacy Sunshine Stamps. Such a cute image! I chose to colour this image with my Chameleon pens and chose to colour it in colours that aren’t necessarily Christmas related. I stamped some snowflakes onto some white card and inked that with distress ink as well a sinking just around the edge of the image mat. The hat I coloured just slightly around the edges and the fluffy bits and then I glittered this as well with some iridescent stickles. I though that this gave a little bit of depth to the furry rim and ball on the hat. I then die cut a string and some individual snowflakes and added these along with a sentiment to the card. I quite like it and hope you do too. Come over and join us at the Dream Valley Challenge our sponsor this week is Dies to die for. For this challenge we are using things from our own stash, so I’ve chosen to use a couple of dies. One is an edgeable die and the other is a peacock. It’s not often that I leave a die cut white, but I felt that the inking behind the die with distress inks and distress oxide inks embodies the peacock colours. These colours also tone in with the gems I’ve added onto the peacock which are my “bling”. To make the side edge die pop I’ve added some of the inked card to the inside right edge of the card as well and of course a few more gems. I also added a sentiment which says ‘just for you’ to finish off the card. I hope you like it! Come and join us at Trimmies Craft Challenge, our sponsor this week is Oddball Art Co. I recently bought a Sheena embossing folder and ran in through with some velum. I felt this would give a great backdrop to this image which I had coloured the image with my Chameleon pens. As this challenge was about ribbon and sparkle I used some of the crafters companion silver sparkle spray. I sprayed this over both the image and the velum so that they sparked and to add a little more sparkle I matted the velum onto silver sparkle card and added silver sparkle ribbon. I hope that you think that this is sparkly enough!! I made this birthday card for my youngest and I’m hoping that she thinks that the middle dog looks like Buddy. I stamped some of the dogs onto post it notes so that I could cut them out and make masks. I love this technique as it so simple to do. If you don’t know what mean by this it’s when you stamp an image in the foreground and then you cover it with a “mask” which is the same stamp which you overlay while you stamp over the top of this, then you remove the mask and the second stamp looks like its behind the first. It allows you to put things behind other things rather than stamping over the top or having to put things next to each other. It’s a good technique when you want to group things like these dogs. Once I’d stamped them all I then water coloured the images with a water brush and distress inks which I picked up from my mat. After colouring the dogs I stamped the “doggone it” sentiment and also a mask for this too. I put the mask over the sentiment and inked around the edge of the card to lightly tint the background leaving the sentiment white so it would pop. I hope you like the dogs! Come join us at trimmies CRAFT challenge our sponsor for this challenge is paper nest dolls. I love this image! It was a pleasure to colour with my Chameleon pens. I felt that this image needed a simple finish so I die cut it into an oval around the image to give me a topper. I inked around the oval with distress ink (I only wanted a light colour so I just used what was on my blue inker). Recently I spotted these really pretty little flowers so I lightly inked those too so that they weren’t stark white. I then added a backing paper from my stash. Come over and join us at the CRAFT challenge our sponsor this week is Little Miss Muffet Stamps. This is the card I’ve come up with. I decided to colour the bunny with Chameleon pens, and used the detail pens to add some zentangle to the hat. I’ve not used zentangle for a while and rather than using red and green I wanted to keep the colours simple. I actually used some zentangle with the grey pen as well in a basket weave type pattern and found that this gave a kind of fur like texture to the rabbit, but because the lines were so close you can’t tell! I chose a paper with snowflakes for my backing paper, and I die cut some snowflakes to complement the winter/Christmas theme. I’d also got an embossed Christmas tree which I’d had embossed in my stash for a while which I’ve finally got to use. The snowflakes and the tree I went over with some sparkly iridescent paste. Finally I die cut the sentiment twice, once in white and once in silver and overlaid these. Come over and join us at CRAFT challenge our sponsor for this challenge is sweet n sassy stamps. The image and the sentiment are from sweet n sassy. I used a white piece of card which I embossed and inked for the background. I’ve used this embossing folder several times for men’s cards as it give an instantly manly feel to a card. The tools fitted with this theme too. Quite a simple design but I think it looks good. 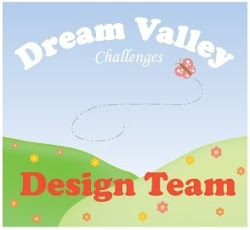 Come and join us in the Dream Valley challenge our Sponsor this time is Star Stampz. I loved the images so much I chose to do two cards as I wanted to use two of the images! I used my chameleon pens to colour this image and some distress ink to tint the background paper, the flowers and the edge of the image mat so that they all toned in. The leaves I cut in green and then used various green distress inks to mottle them. Once again I used my chameleon pens to colour the image and some distress ink to tone everything to come together. The sponsor on my blog isAll Dressed Up!. And you can win 2 digital stamps from All Dressed Up! by adding your name to the Inlinkz at the end of this post. 1.Make a project for this challenge and your entry will be put in the random draw for the prize byDi’s Digistamps. 2.Visit the blogs of our DT and enter into their Inlinkz to be put in the random draw for the prize on their blog. 3.The Top3 will again be chosen as every week as well. 4.No sentences hunting this year I’m afraid. You should have come here from Brenda’s Blog and as you can see your next stop isHester‘s blog. The start and finish of this blog hop are atCRAFT Challenge Blog. Your next stop is Hester‘s blog. Enjoy the rest of your hop! Don’t forget to add your name to Inlinkz below to be in with a chance of winning the prize on my blog.